Simon & Schuster Books for Young Readers, 9781442471863, 336pp. Another wild mystery needs to be solved and it’s up to the Pumpkin Falls Private Eyes to solve it in this hilarious follow up to the heartwarming middle grade mystery, Absolutely Truly. Even Truly Lovejoy has to admit that teeny-tiny Pumpkin Falls, New Hampshire, has its charms—like the annual maple festival, where tourists flock from all over to sample the local maple syrup, maple candy, maple coffee, and even maple soap! But when someone tries to sabotage the maple trees on her friend Franklin’s family farm, Truly has to rally the Pumpkin Falls Private Eyes to investigate. Meanwhile, she uncovers another, more personal mystery under the floorboards of her very own home—a diary written centuries ago by her namesake, the original Truly Lovejoy…and it might just prove her family’s ties to Pumpkin Falls run deeper than anyone ever could have imagined. "In her down-to-earth, vulnerable, unassuming voice, Truly reveals her love of swimming and bird-watching, her growing crush on a classmate, her unfounded jealousy of Mackenzie, and her irritation with her interfering younger sister. 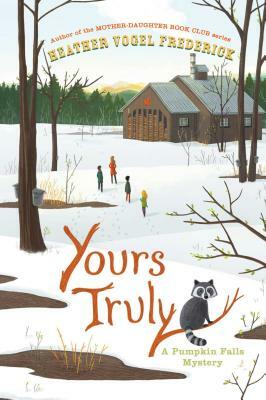 Truly's fans cheer the return of the likable sleuth in this family-oriented mystery in which past and present collide." "Historical subtext about the Underground Railroad and the New Hampshire setting add special dimensions to this rural mystery. Truly's fans cheer the return of the likable sleuth in this family-oriented mystery in which past and present collide." "Fans of cozy mysteries, get your blankets and hot cocoa ready!"